A little late writing my blog post about my trip to Venice, but I could not miss out a post on my FIRST EVER TRIP ABROAD! I won this from Manfrotto Imagine More on Facebook, so I owethem a very big "THANK YOU!" as it wouldn't have been possible without them. We left at around 6am from home in Liverpool to get the coach in the city centre to Manchester as that's where our flight was from. We needn't have rushed really. The later coach would have only left us 1 hour to check-in, but we got checked-in really quickly and we I don't think it would have mattered in the slightest if we'd got the later coach. As it was, we had a 3 hour wait at the airport for our flight because we preferred to get there too soon than too late. It wasn't Paul's first ever trip abroad, but he hasn't been abroad since he was 16 with his parents, so it was his first trip as an adult. But my first trip EVER. It was both exciting and scary! We had to get 2 flights on the way - Manchester to Munich and then Munich to Venice. I'm not that great with heights, so while I was really, really looking forward to my first trip abroad, I was also dreading how I would be on the plane. I was nervous on the take off, but I must say, it wasn't bad at all. Not being used to the sound of the plane or when the plane turns, I was a little bit unnerved the first few times there was a noise or it turned, but I soon got used to it and knew what to expect. By the time we were getting on the Munich to Venice flight, I was much more confident. We arrived at Marco Polo Aeroporto in Venice at around 4.30pm. We then had to walk to the vaporetto (water bus) station to get across to the main bit. It took a whopping hour and a half or so on the vaporetto and it wasn't the most comfortable ride ever, with them really thwacking the boat into the ports each time, that plus the diesel fumes were suffocating, so I actually had a really bad headache by the time we got there. Once we got off the boat though and out into the air, it was very refreshing. We headed off to our hotel - the 5* Hotel Bauer - to check in. The receptionist was very warm and friendly and welcoming. She took us to our room and showed us around. Our room (room 225) was very nice - spacious, comfortable and nice amenities. There was an in-room bar, but we stayed clear of that as it was VERY expensive - €6 for a tiny bottle of water or €8 for a tiny bottle of Coca Cola for example! 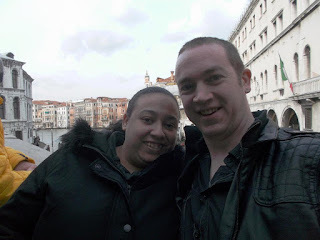 We didn't stay at the hotel very long before venturing off into the night to explore Venice. We weren't there for very long overall, so we wanted to make the most of it. So glad you had a fab time Yvonne. I remember my first time flying I was so scared I left a nail imprint in hubbies hand! Some of the costumes in the photo's look amazing. But I don't envy you the water taxi ride. Was tempted to ask if the photo of Paul sat with the water behind was the Mersey LOL. Could be the Pier Head!